Chess Nie, Xingtie 108 This course welcomes student players of all levels. Crafts Mu, Aurora 123 This course leads students to make origami paper craft products like birds, animals, stars, flowers baskets, boxes and so on. Drawing Yong, Kim 105 This course not only teaches students the basic techniques of drawing and painting, but also cultivates them to develop ways of creative and artistic thinking. Speech/Debate Xue, Yan 109 This course introduces a fun, varied, and realistic debating topic at each class for students to practice organizing and expressing their ideas and opinions in Chinese. The teacher aims to help students build their own speech styles, good speaking manners, and joyful teamwork spirit. Grade 4 and above students are welcome to this course. Chinese as Second Language (CSL) Huang, Yan 146 This course develops students’ four language skills of listening, speaking, reading, and writing. By the end of this course, students are expected to master part of the basic grammar, to be able to communicate in some real-life situations in a Mandarin-speaking environment, and to read and write with an active vocabulary of 150 simplified characters. 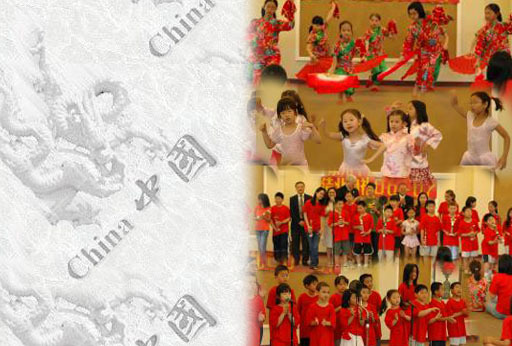 Grade 1 Yong, Kim 105 Ma Liping (Grade 1) This course focuses on Chinese Pin Yin and characters (creation, evolution, and stroke orders). Reading and writing skills are introduced. It includes basic sentence pattern analysis and development of language skills in listening, speaking, reading, and writing. Grade 2 Leng, Ling 106 Ma Liping (Grade 2) This course further emphasizes Chinese Pin Yin, character, and sentence composition. Students will gain additional proficiency in understanding, speaking, reading, and writing Mandarin in practical situations. Grade 3 Chen, Linda 107 Ma Liping (Grade 3) This course teaches grammar and improves reading and writing skills in Mandarin. Continue to build up students’ vocabulary and teach them how to compose correct sentences. Dictionary use is introduced. Grade 4 Yin, Hui 109 Ma Liping (Grade 4) This course asks students to use their own dictionary and get ready to read simple Chinese articles. Students will be able to write Chinese letters, articles, short stories, and much more after taking this course. Grade 5 Nie, Xingtie 108 Ma Liping (Grade 5) This course focuses on the following aspects: (1) expanding and enriching students’ vocabulary significantly; (2) introducing advanced Chinese grammar; (3) developing the students’ abilities to read and analyze modern Chinese prose, essays and short stories; (4) basic training of Chinese writing. Grade 6 Xue, Yan 123 Ma Liping (Grade 6) This course provides students with basic knowledge and techniques of argumentative composition (300-600 words each). Students are expected to be able to articulate their views convincingly in both spoken and written modern Chinese language after taking this course. Grade 7 Li, Xue 132 Zhong Wen (Level 7) This course helps students get ready for HSK Elementary-Intermediate test or SAT Subject Test in Chinese. Kindergarten Wang, Yanhong 103 Ma Liping (K) This course is a fun start to learn Chinese. Focusing on Chinese Pin Yin, speaking, and listening. Writing Pin Yin and simple characters are encouraged. * Information listed above is subject to change at any time, please check back for latest updated version.